Our engine reviewer goes back in time to the classic outboard motors of yore, in this case the popular Johnson 25 engine. The Johnson 25 is a classic 25hp outboard engine. It had die-castings with low copper-content alloy, so saltwater corrosion was rarely a problem. In February this year when my brother-in-law Tony brought over his beautifully-restored 1979 de Havilland Mustang runabout for testing, I noticed it was still powered by the original Johnson 25 outboard motor. With a couple of pumps of the fuel-primer bulb the Johnno 25 fired-up and once warm, settled down to the low-vibration idling rpm that separated this engine from its twin-cylinder loop-charged competition. Testing the boat with Tony on Lake Macquarie, NSW, brought back happy memories of when I bought this boat new in January 1980. Apart from dirty fuel once, the engine has never let me down during the 212 hours I clocked up before selling it to Tony. 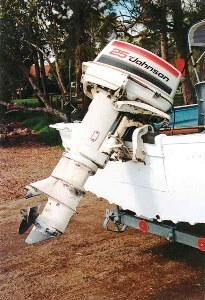 The Johnson 25 outboard motor was introduced in 1969, as an up-rated version of the Johnson 20 that was released a couple of years earlier, itself a development of the popular 18. Long-shaft models had a five inch (127mm) extension added to the short-shaft leg. The original Johnson 25 engine had a 360cc twin-cylinder cross-flow powerhead with a cylinder bore of 63.5mm and piston stroke of 57.2mm. The above-prop exhaust lower unit had a ratio of 1.75:1 with a cooling-water intake directly ahead of the exhaust outlet and twin-contact ignition points were fitted. To achieve the increased output the maximum power was developed at 5500rpm instead of 5000. Remote-control models used the twin-lever Shipmaster control box, which had a throttle friction-adjusting knob and was remarkably easy to service. Electric starting was available as an option, although the manual overhead-recoil starter was omitted. Through the early ’70s the 25 remained essentially unchanged until 1977, when the powerhead from the Johnson 35, released a year earlier, was used. By increasing the cylinder bore to 76.2mm the piston displacement rose to 521cc, giving the 25 the largest piston displacement of any 25hp outboard available. The lower unit with the same gear ratio was retained from the smaller-displacement 25 and, thankfully, OMC kept the strong fibreglass upper cowl at a time when the Japanese competition had plastic cowls. Sensibly, on 1977 models and onwards, OMC cross-linked the choke knob with the throttle linkages eliminating the need to open the throttle for cold starting. Back then, however, outboards were rated at the flywheel and even with its 45 per cent greater piston displacement the Johno developed only 23.7hp at the prop at 5000rpm. And it wasn’t until 1978 that the 25 was fitted with capacitor discharge (electronic) ignition, although it still didn’t have a full-tilt lock. Then, a shallow-water drive position acting on the trim-pin rod was fitted. When the ICOMIA 28/83 directive was introduced in 1983, OMC had to prop-rate the 25, not difficult as the powerhead was de-rated from the 35. The up-rated 25 developed 25hp at 5000rpm, bringing it in line with the Japanese models. In 1984, the old above-prop exhaust lower unit was dropped, replaced by the one-piece leg for both short and long-shaft versions and a lower unit with 2.15:1 ratio from the Johnson 30. There were five trim positions instead of four and a tilt lock was fitted, making the engine more user-friendly to compete with the Japanese 25s. However, OMC still retained the Shipmaster box whereas the Japanese engines had single-lever boxes and electric-start versions retained their manual overhead-recoil starters. They also had effective bowl-type fuel filters, whereas the Johno had only a cleanable screen at the fuel pump. Two years later and to compete with Yamaha, OMC swapped the traditional 50:1 fuel/oil premix to 100:1 for recreational usage (after the 10-hour break-in period on 50:1). But in 1990, when the 25 was sourced from OMC’s other plants following the demise of its Bankstown, NSW, assembly facility, the engine again became a 50:1 model and this time needing the first 10 hours at 25:1. Unfortunately, the plastic carbie air-intake cover was removed, leaving an open venturi that debris could easily enter. By then, the fibreglass upper cowl had been replaced by a plastic unit, but at least the lower unit was more hydrodynamically-efficient than the 1984 model and the zinc anode was relocated to above the anti-ventilation plate to further reduce drag. The old manual choke was swapped for a cold-start fuel primer and pulling out the primer knob three or four times provided a sufficiently rich air/fuel mix for easier cold starting. The Shipmaster control box was replaced by a single-lever unit. When BRP took over production of Johnos in 2001, it retained the 25 for four years until it was dropped when the entire two-stroke Johnson range was discontinued. Like all cross-flow two-stroke Johnson outboards, the 25 was never fuel efficient, but unlike the loop-charged Japanese competition, it would troll smoothly for hours without missing a beat once the original surface-gap sparkplugs were swapped for J-gap plugs. Cold starting of the ’79 model required a firm two-hand pull, but once warm only one hand was needed due to the inherent balance of the engine and relatively large flywheel compared to the loop-charged 25s. On the 4m Mustang, pushing a total of 350kg, including two adults and fishing tackle, and spinning an 11in-pitch alloy prop, the trolling averages during trials were 5kmh (2.7kts) and 750rpm using 1.2lt/h. Oil smoke appeared after 15 minutes of trolling operation. To help overcome the bow-heavy nature of the Mustang when two adults were forward, I normally used the third trim-pin hole. On this setting we planed at 25kmh (13.5kts) and 3500rpm. At 4000 revs the averages were 32.5kmh (15.5kts) and 6.3lt/h, but through a tight figure of eight turns at these revs prop ventilation always occurred unless the engine was trimmed in, which then reduced WOT speeds. On the third hole the WOT averages were 46.4kmh (25kts) and 12.7lt/h at 5500 revs, while in average usage the Johno consumed 5lt/h. In 1982, I tested a 430cc Tohatsu 25 with the old above-prop exhaust lower unit on the Mustang for almost a year and although it provided similar speeds to the Johno under identical test conditions, it used about 20 per cent less fuel. The single-lever remote control box was easier to use and because an alternator was standard, a tachometer could easily be wired in once a rectifier kit was installed. However, because the choke was not cross-linked with the throttle, cold starting was finicky and below 1500rpm the Tohatsu’s vibration levels were too high for extended trolling periods. A brief test of a 1985 Johnson 25 on a 4.27m Quintrex runabout showed it to have significantly more power than the ’79 model and two-up it averaged the same speeds as the Mustang. Powerhead access is excellent and servicing is recommended every 100 hours or annually. Like all OMC outboards, the Johnson 25 had die-castings with low copper-content alloy, so saltwater corrosion was rarely an issuethe Johnson 25 had die-castings with low copper-content alloy, so saltwater corrosion was rarely an issue. Despite not having a zinc anode there’s little corrosion on the leg and lower unit of Tony’s ’79 Johno, although there is paint abrasion on the lower unit and prop from using the shallow-water drive excessively! The throttle/gearshift cables were not so corrosion-resistant and since new two sets of cables have been needed due to the plastic casings cracking and allowing salt spray to reach the cables, which then rapidly rust. Overheating was rarely a problem, because a good run at WOT would normally flush out the cooling-water passages. Even though Tony’s engine has had only four waterpump impellers fitted since new, cooling water flow from the pilot-water discharge remains very strong. OMC recommended replacing the cylinder head gasket every 300 hours, or five years and paint bubbling around the cylinder head gasket indicates overheating at some stage. From 1980 onwards, low-hour failures of CD packs were common. But the real problem was the standard fitting of Champion L77V surface-gap plugs, which had too high a current draw on the CD pack, which shorted out. Tony had the same problem at about 300 hours needing a new CD pack, but swapping for Champion L77JC4 J-gap plugs solved the problem and for the past decade the current CD pack has been working fine. The J-gap plugs also burn off oil deposits that occur when trolling because the fuel/oil mix is too rich for the engine to fully combust, causing surface-gap plugs to rapidly foul up.